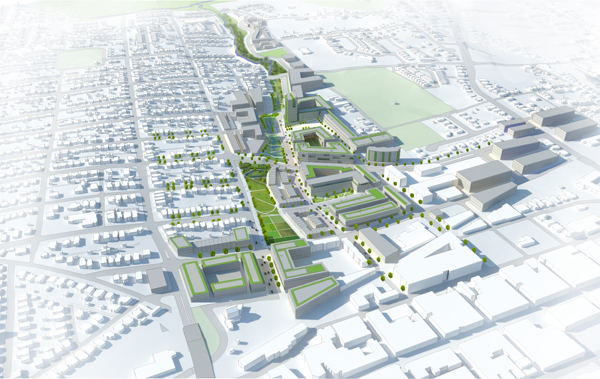 The Congress for the New Urbanism (CNU) honored architecture and urban design firm Cunningham | Quill Architects for the Strategic Area Investment Plan in Charlottesville, Virginia. Pictured from left to right: Eliza Harris Juliano, Chair of the Board of CNU, Lee Quill, FAIA, Founding Principal of Cunningham | Quill Architects, Kathy Galvin, Council Member of the City of Charlottesville, and Lynn Richards, President and CEO of CNU. 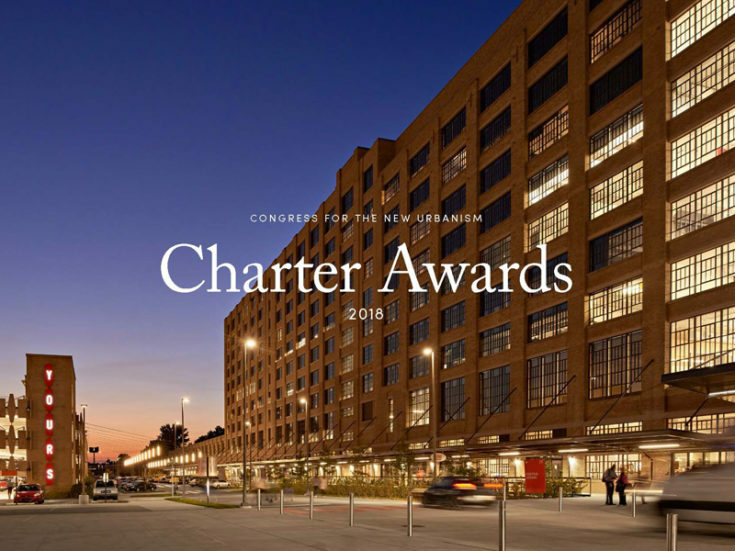 The project is among eleven professional and three student winners of its 17th annual Charter Awards, which recognize exemplary projects by local government, developers, architects, urban designers and others engaged in revitalizing and creating coherent cities, neighborhoods, and metropolitan regions. Winners are chosen because they not only embody and advance the principles of the Charter of the New Urbanism, but also because they make a difference in people’s lives. 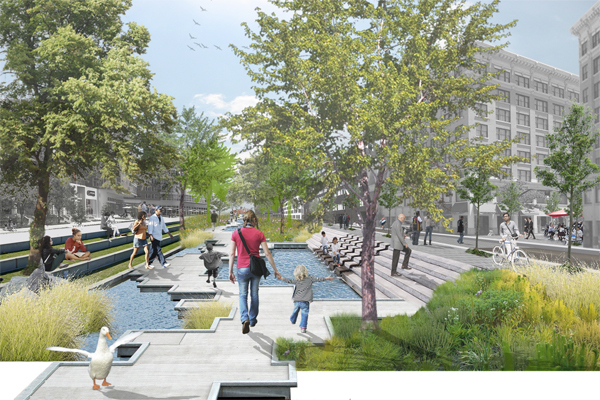 The Strategic Area Investment Plan calls for the creation of a 12-acre linear ecological park that incorporates new stormwater systems while creating multi-functional community open spaces. The plan showcases sustainable best practices as it creates civic spaces for informal gathering and community interaction. New mixed-use, mixed-income neighborhoods reweave former industrial and public housing sites with the adjacent historic neighborhoods and reconnect the area’s pedestrian, bicycle, and street grid system. Proposed mixed-use buildings provide opportunities for live/work spaces and increased access to service retail. The project is governed overall by a form-based code. “These recommendations will improve the quality of the built environment and the quality of life for our residents,” said former Charlottesville Mayor Satyendra Singh Huja at the time the project was approved. This year, CNU recognized eleven professional designs and three student design projects across the United States and in South Africa, England, Costa Rica, Argentina, and Iran. 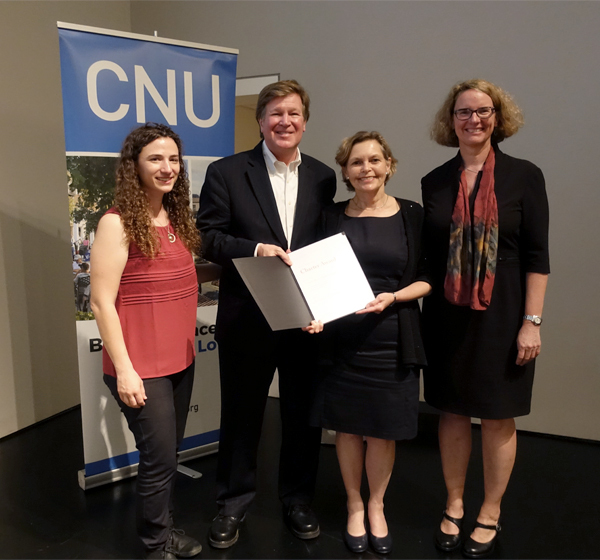 The awards were announced at a ceremony May 18, during CNU’s annual Congress, a 4-day event that brought together over 1,600 people to discuss, debate, engage, and advance innovations and strategies in city- and town-building.